Happy New Year! Tonight at the stroke of midnight there are fireworks displays at several locations across NYC and Brooklyn to celebrate the coming of 2014. 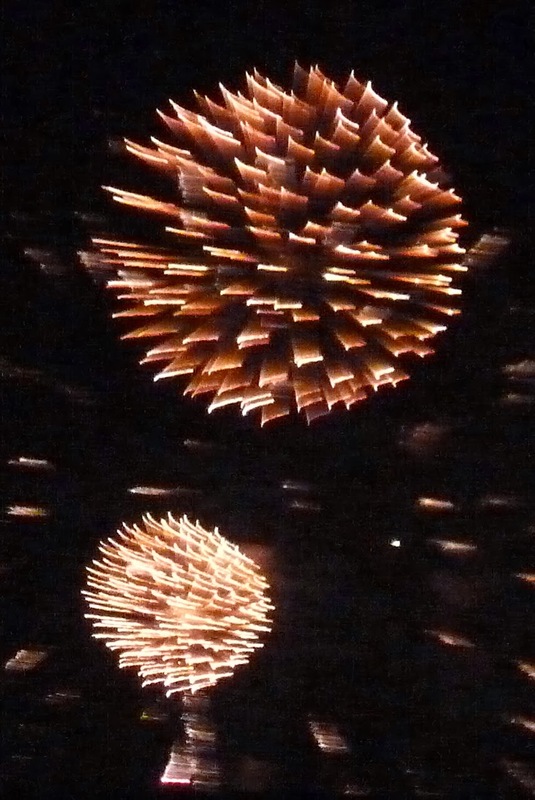 If you're inland in Brooklyn, you'll see firework being launched from the Long Meadow of Prospect Park. From Brooklyn Heights, Cobble Hill, DUMBO, Red Hook and other waterfront neighborhoods, catch the display being shot from New York Harbor, near Liberty Island. In central Manhattan, the fireworks are erupting from Cherry Hill in Central Park. 1: The NYC Dept. of Sanitation will begin its annual Christmas tree curbside collection and recycling program on Monday, December 30. The program will run through Wednesday, January 15, 2014. 2: As an alternate, the Parks & Recreation Department will be hosting Mulchfest 2014 on Saturday, January 11, 2014 and Sunday, January 12, 2014 from 10 A.M. to 2 P.M. at drop off sites throughout the city. To find Brooklyn (and other) locations, visit the Parks & Recreation website. You can drop off your Christmas tree at designated parks for mulching and can pick up free mulch. Mayor-elect Bill de Blasio has broken with Mayor Bloomberg's practice of appointing lawyers and magazine publishers to run NYC's Department of Education . . . and appointed a respected educator, Carmen Fariña, as Schools Chancellor. Fariña is a legend in Brooklyn, where she spent decades as a teacher at P.S. 29 in Cobble Hill and as a District and Regional administrator. On Monday she said she would create an easier way for parents to interact with DOE, and promised to bring back arts, social studies and the sciences. De Blasio said he would not allow any new school co-location plans for now. 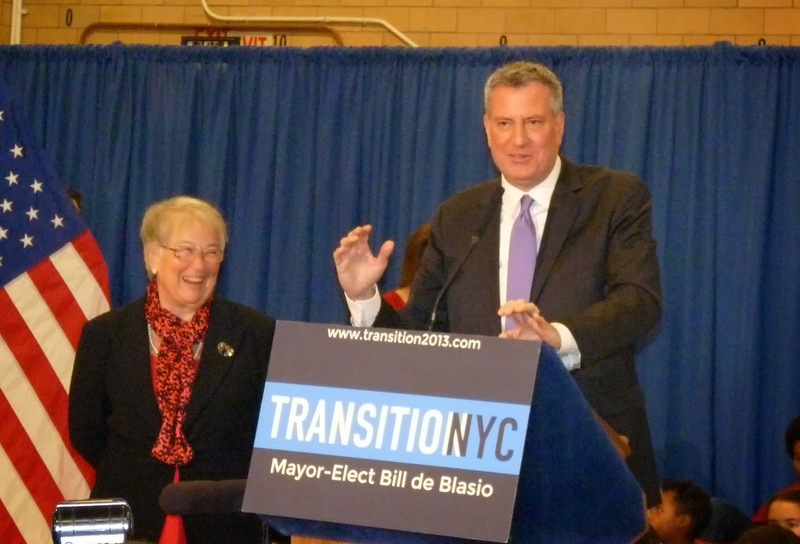 He also announced that Ursulina Ramirez, an official on his transition team and a former social worker, would serve as Fariña’s chief of staff. Miley Cyrus is back in Brooklyn at Barclays Center for her Bangerz tour on April 5, 2014. They range from behind-stage seats for $86 - $95; to middle-distance seating for roughly $200; left and right of stage for $500; and floor tickets from $724 - $5018. Prices for similar seats are more (up to $6,000) at other ticket sites we checked, but you may be able to do better. Brooklyn: Nassau Ave & Mcguiness Blvd EMS on scene with a pedestrian struck by vehicle Aided is DOA on scene, NYPD Hwy CIS requested. NYC has set up a Citi Bike Pedal Power Station at 7th Avenue and 42nd Street with six Citi Bike bicycles for tourists to ride to generate energy to light the New Years Eve ball. The energy generated is being collected and stored in batteries until the big celebration. The Citi Bike Pedal Power Station is located on the Southeast corner of 7th Avenue and 42nd Street. It was open over the weekend, and will be open again today from 10:00 AM to 8:00 PM. Citi Bike brand ambassadors will be on-site taking photos of participating riders. Participants will receive a free Citi Bike day pass and they will be sent a digital photo of them helping power the Ball that they can save and share. More here. From the scanner: Police have been called to instigate a "suspicious duffel bag" left on the B train stopped at roughly 2:15 a.m. early Monday morning at Flatbush and De Kalb Ave. According to NYPD dispatch, the bag was found in car number 2640 on the B express. Donate to Brooklyn Charities Before the End of 2013! Charity starts at home with the Brooklyn Community Foundation. Want to donate to worthy charities and help your Brooklyn neighbors . . . before the clock strikes midnight on December 31? Brooklyn Community Services: Brooklyn Community Services is one of the oldest, not-for-profit, non-sectarian social service providers in New York City. They work with families at risk of separation; people with psychiatric illnesses; adults with disabilities; people moving from welfare to work; and children who need support and guidance. St. John's Bread and Life: Bread and Life brings food and assistance to the poor and provides other necessary services through their soup kitchens, medical programs and legal programs assisting the needy with Medicaid and food stamps. 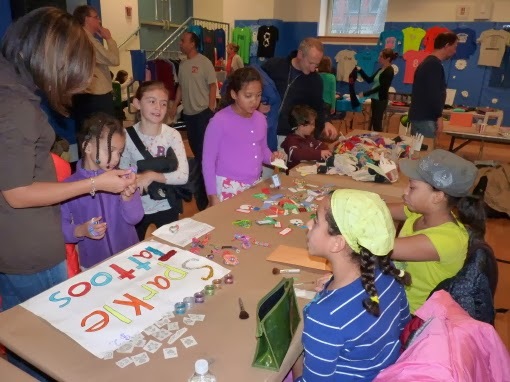 Red Hook Initiative: Award-winning RHI provides long-term programming to youth ages 10 – 24in underserved Red Hook. 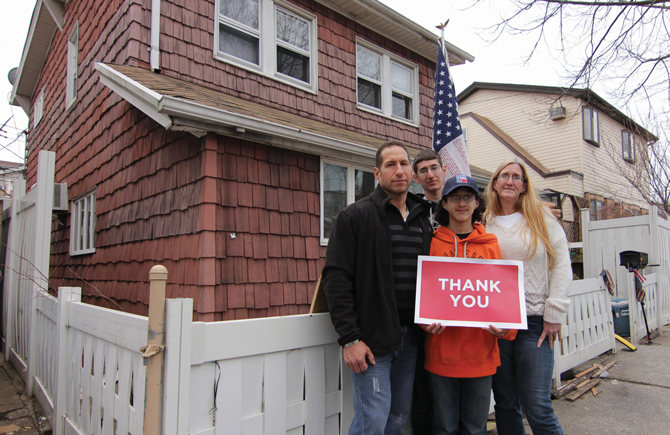 When Hurricane Sandy hit, RHI became a hub for relief and rebuilding work. Bed-Stuy Campaign Against Hunger: With $5 billion in food stamp cuts, some Bed-Stuy families are in danger of going hungry. BSCAH operates NYC’s largest emergency food pantry. The organization also provides nutrition programs for seniors, and healthy eating and anti-obesity classes for kids. CHiPS of Park Slope: CHiPS serves the hungry and homeless with a soup kitchen (serves about 200 a day) and women's shelter. Nearly 80 percent of the food that volunteers prepare is donated by the Park Slope Food Coop. $10 provides six meals! Catholic Charities of Brooklyn and Queens: You don't have to be Catholic to appreciate the work done by Catholic Charities, which has more than 160 programs providing affordable housing, nutritious meals, recreation for seniors, residences for the developmentally disabled, and assistance to neighbors in need. Good Shepherd Services: GSS focuses on high-need communities in Brooklyn and the Bronx. They provide services to help youth. 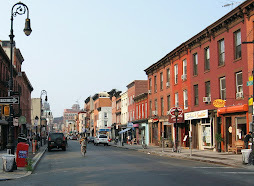 In Brooklyn, they serve the neighborhoods of Bensonhurst, Brighton Beach, Bushwick, Canarsie, Coney Island, Downtown, Gowanus, Park Slope, Red Hook, Sunset Park, and Williamsburg. Children of Promise: Based in Bed-Stuy, COP helps invisible victims -- the children of incarserated parents -- with an after-school program, mentoring and summer day camp. They also provide transportation so kids can visit their parents, and help them connect by writing letters to mom or dad. Cops Chase 3 Armed Robbers on 7th Ave., Park Slope, Sunday p.m.
From the scanner: The 78th precinct is chasing a group of men who allegedly robbed a Radio Shack on Seventh Ave. and 5th Street in Park Slope. Description: Three male blacks, in their 30s, wearing all black, sunglasses, face masks and gloves. They fled the scene of the robbery at roughly 7:15 p.m.
One man has a silver firearm. The group is carrying a Radio Shack bag. The perps are driving a four-door dark sedan, partial license plate possibly 7355. They may be heading south towards the 72 Precinct. Opponents of the Brooklyn Heights Branch Library redevelopment say they plan to comment “None of the above” or “Just fix up our old library” to Brooklyn Public Library's suggestion site, where the public can comment on all seven proposals. Instead of fighting the plan to raze the old building and replace it with a tower, Deborah Hallen, president of The Friends of the Brooklyn Heights Branch Library, thinks residents should instead work the system to get a new school for youngsters. She told the Brooklyn Eagle that there aren’t enough schools in the neighborhood. P.S. 8’s preschool is closing, and kindergartners are going to be put on a waiting list next year. To seal the deal, Hallen wants the condo developers to devote space to a new pre-K and kindergarten. “You buy a place in Brooklyn Heights thinking you’re going to get into this wonderful school, only to be put on the wait list,” she said. Residents opposed to the redevelopment say the whole thing is a real estate giveaway of public property, and it stinks of Bloomberg. Eagle commenter Marsha Rimler says: "Hallen's request for a K and pre K can easily be incorporated in a community plan without the developer giveaway. This is public land where public needs can be met. It can be the first 'public mixed use' building with smart thinking." - Will Brooklyn Public Library's Self-Checkout Machines Work Better Than CVS's? For some people, shopping After-Christmas sales is part of the holiday fun. Downtown Brooklyn has more major chain stores than ever before, and the sales have begun. Savings range from 20 - 70 percent. Brooklyn Industries: Brooklyn Industries has started their Winter Mega Sale, with winter styles up to 50 percent off. This includes pretty much everything: T-shirts, dresses, coats, skirts, bags, sweaters, the works. There's a fleece jacket for women marked down from $74 to $39.99, and a roll-cuff T-shirt from $44 to $19.99. Men's patch pants have been reduced from $72 to $29.99. The markdowns on men's winter coats and women's winter coats and jackets are substantial. The woman's Voyager wool parka with lined hood has been marked down from $238 to $99.99! Aeropostal: Aeropostal is throwing a crazy clearance sale with up to 70 percent off. Girls black boots / white combat boots have been marked down from $48.50 to $16.99/ $19.99; Lola Rhinestone jeggings were $59.50, now $14.99. Coupon: $10 0ff purchase of $40 or more. Macy's: Macy's Wow! Pass sale starts Friday. (Click here for a Wow! 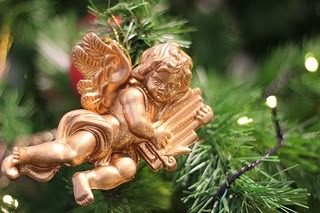 Pass coupon for an extra 15 percent off, or, online, use promo code MERRY.) Macy's denim (jeans) sale starts Friday: Ladies Levi's have been marked down from $54 to $39.99. Men's jeans marked down from $58 to $39.99. PLUS you get a $10 savings card with any denim purchase. (So maybe if you need two pairs you should buy them one at a time?) Also, now's the time for men to buy dress shirts and designer suits: buy one, get one free. Ladies get a similar deal on bras. ALSO: 60 percent off all quilts; 40 - 60 percent off sheet sets. Sale flyer here. Armani Exchange: Looking for an upscale dress or fancy Tee? Armani Exchange is chopping up to 50 percent off many high fashion styles for men and women. A ladies' tweed blazer has been marked down from $148 to $109. Several jackets have been reduced from $228 to $199. Modell's: Need a hoodie, shoes, a backpack or sports products? Check out Modell's, with 30 - 50 percent off items for men, women and kids (but more for men). Express: Take an additional 20 percent off already reduced merch, for up to 60 percent off. All jeans 40 percent off; women's dresses 30 percent off; men's shirts and ties - buy one, get the second for $19.99; men's sweaters - buy one, get the second half off. Gap Outlet: Here's a coupon for 15 percent off $75+ through Dec. 30. And 20 percent off $100+. H&M: H&M is discounting merchandise up to 70 percent. A satin dress is marked down from $24.95 to $10. Pair with a dinner jacket marked down from $34.95 to $15; or a faux fur jacket, reduced from $60 down to $20. Men can pick up slim jeans, marked down from $39.95 to $20. Lane Bryant: Get up to 50 percent off on sale items, like a textured sweater dress - was as $79.95, now $39.97. Payless: Entire shoe stock is up to 30 percent off or more on red tag models. The Children's Place: Huge sale, up to 75 percent off with a 30 percent discount coupon. 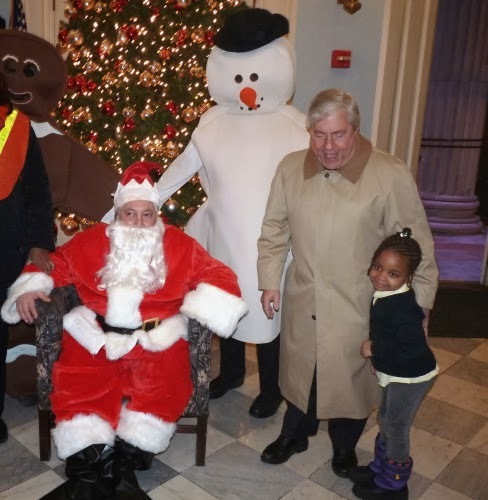 Today, Brooklyn Borough President Marty Markowitz shared his best wishes for a happy holiday season with a Brooklyn-themed version of “'Twas the Night Before Christmas." Where Brooklynites sing praise for so many things. Is there another city that’s quite as unique? In skinny jeans and flannel, all colors and kinds? They jam to Jay-Z and Beyonce; how dope! In Coney Island, the polar bears cheer! In Prospect Park, gliding at the speed of light. And can’t wait for next year to welcome their Isles! In East Flatbush, home to the joyful steel pan. Ensuring there’s plenty of good times to spend. 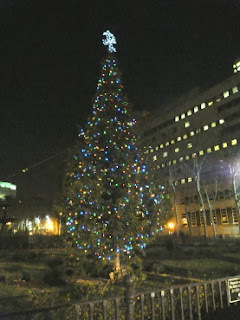 To Bed-Stuy and twinkling of Kwanzaa lights! Sipping hot cocoa or peppermint tea. They gear up for shopping; in Brooklyn, of course! For all that’s artisanal and of local source. Whether in Dyker Heights or in Canarsie. Feel like a Grinch? Well, ‘fuhgeddaboudit’! Now Gravesend! Now, DUMBO! Now, Red Hook and Weeksville! On, Bushwick! On, Marine Park! On, Clinton Hill! No matter your neighborhood, Brooklyn’s just great! And head home to family and friends to make merry! Gov. Andrew Cuomo has postponed closing Interfaith Medical Center, which serves Bedford-Stuyvesant and Crown Heights, for a month or two. UPDATE: The reprieve will last three months, according to the Brooklyn Eagle. Interfaith sees some of Brooklyn's sickest people and handles thousands of psychiatric cases. Long Island College Hospital (LICH) in Cobble Hill, Brooklyn, is also teetering on the brink after being stripped of assets and patients by its overseers, SUNY Downstate. Both hospitals treat hundreds of thousands of Brooklynites in multiple neighborhoods. 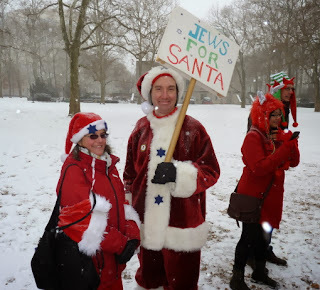 No comprehensive studies, however, have been carried out concerning the health care needs of the Interfaith or LICH service areas, and how these patients could get health services, especially emergency services, if their hospitals were closed. - Gallito's on Montague Street: “Mexican Urban Cuisine” -- features dishes like duck enchiladas with mole sauce and fire-grilled shrimp marinated in chipotle and chocolate. 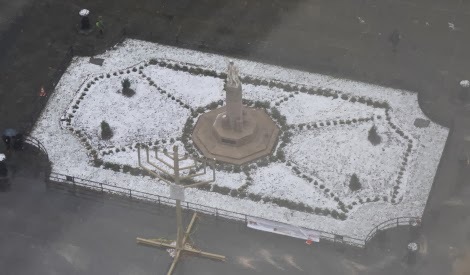 [Brooklyn Eagle]. Artist Mike Deodato* packed and shipped an incredible piece of original art depicting Hulk vs Wonder Woman, and mailed it in late November to a client. But the client never got it. USPS say it was delivered to a person called J Chiusano in Brooklyn. 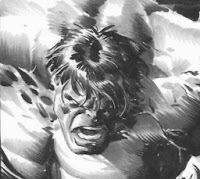 If you know Chiusano or have seen the art, please contact mdeodato@terra.com.br so it can be returned to its rightful owner. More details and a photo of the entire artwork at Bleeding Cool. Crowd in Downtown Brooklyn went nuts outside a Foot Locker this weekend over Air Jordan 11 “Gamma Blue” sneakers, just released Saturday. 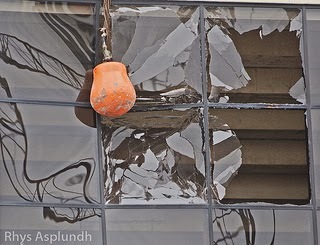 Brooklyn is not the only location where fights broke out. According to Slate, at least three fights broke out inside a Finish Line shoe store in California; another erupted in Dallas; while in the Bronx, two people were caught on video fighting outside a Foot Locker. The shoes cost from $185 to $230. McBrooklyn has to run upstate and pick up some relatives for a Christmas visit. We'll be back tomorrow -- let us know if we miss anything! From the scanner: A call came in at 12:38 a.m. early Thursday morning that a man had a toothpick stuck in his ear. 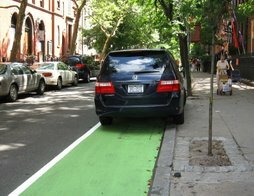 His location was reported as Tillary and Adams Streets in Downtown Brooklyn. He was reported to be in a gray Highlander. From the scanner: A report came in to the NYPD at roughly 9:10 p.m. Wednesday night that "two transsexuals" robbed someone on Monroe Street near Marcus Garvey Blvd. in Bedford-Stuyvesant. 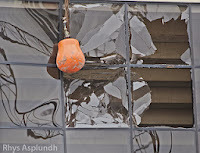 Police responded to the scene; the outcome is not known at this time. “I am humbled to have the support and confidence that my colleagues have placed in me," @MMViverito says in statement. A progressive Latina, @MMViverito will reshape city divided by inequality into NYC built for everyone, not just wealthy and well-connected. "I am pleased to announce Brooklyn is supporting Melissa Mark-Viverito for Council Speaker. She shares the progressive values of my members and is the right leader for New York. We are united in her candidacy and believe with our support Melissa now has the majority of the votes needed to elevate her to speaker." Bill de Blasio is said to have made his preference for Ms. Mark-Viverito known to Council members. Politicker reports that 30 Council members officially threw their support behind her as well. Please to announce that I am pulling out and supporting my colleague @MMViverito for speaker. Well, anything could still happen I guess. But it looks like @MMViverito can probably start measuring the drapes. Congrats to her! Come to the 64th Annual Christmas Tree Lighting Ceremony by the Brooklyn Heights Garden Club on the Promenade. 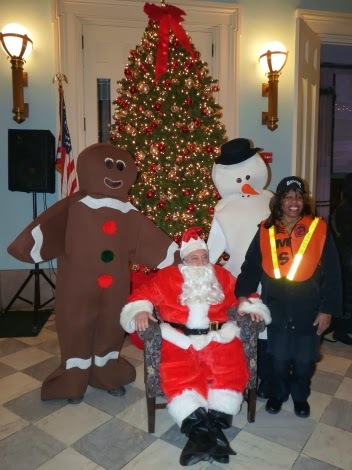 On Wednesday, December 18, at 5:30pm, the Brooklyn Heights Garden Club brings the holiday spirit to Brooklyn Heights with their beloved annual tree lighting ceremony. Santa Claus will join the festivities, handing out candy canes while carolers from the Grace & Spiritus Chorale sing Christmas carols. 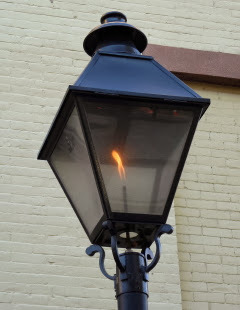 The lighting ceremony will be held at the Esplanade at the foot of Montague Street. Caroling along Montague Street will commence following the ceremony. 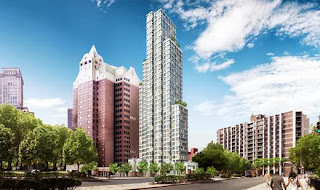 LICH Development on Hold: Are SUNY Trustees Starting to Catch On to Their Big Fat Brooklyn Problem? 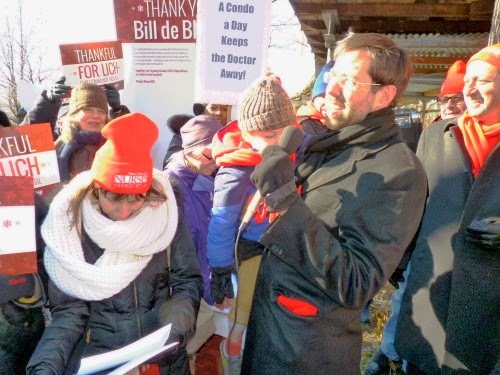 In a vote of no confidence in SUNY Downstate's President Dr. John "Skip" Williams, the SUNY board of trustees on Tuesday voted to shelve a resolution that would have allowed Downstate to start negotiating with a mega-developer who wants to turn LICH into condos and an urgent care center. Developer Fortis Property Group, one of drivers behind the development of the Williamsburg waterfront, told SUNY it would lease most of the main hospital building to ProHealth, which specializes in primary care. The other roughly 20 LICH buildings would be turned into condominiums. 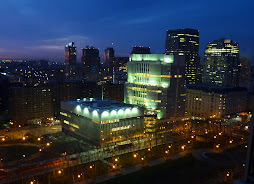 It has taken this long for SUNY trustees (all of whom face contempt charges on Jan. 21) to catch on that there is something VERY WRONG at SUNY Downstate, and that they may be left holding the bag after Skip is long gone. The farce that is SUNY Downstate's smoke-filled room deal to sell of LICH's Cobble Hill real estate to a developer continues today at the SUNY board meeting in Manhattan. There, the same folks who will be dragged kicking and screaming into Justice Baynes' courtroom on Jan. 21 to face contempt charges will vote to sell the 150-year-old hospital for parts and maybe $400 million, depending how you count it. 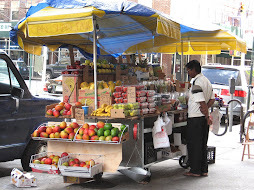 - The gargantuan new market is located at 214 3rd street in Gowanus at the corner of 3rd Avenue, not far from the R train (get out at Union St/4th Ave). The G and F trains aren't too far, either. - A 'simple bread breaking' ceremony takes place at 8:30 am, with doors opening at 9 am. The first 250 people in attendance will receive a free tote bag. - Deep discounts all day Tuesday, including 6 - 8' Fraser fir holiday Christmas trees 50% OFF at $24.99/each, regularly $49.99/each. - You can come in and shop, but why carry groceries home? Let your cashier know you'd like home delivery at check out. - The Brooklyn store carries products from many local small vendors: Brooklyn-made ice cream, yogurt, pies, rice & miso, cupcakes, mayo, coffee, scones, granola, etc. 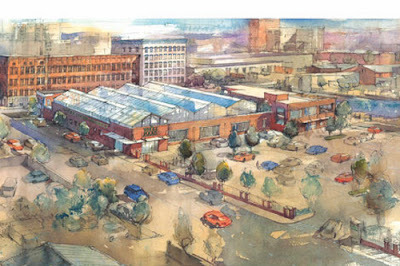 - The Roof, a rooftop taproom & bar, will carry 16 beers on tap, plus canned and bottled brews and local Brooklyn food. 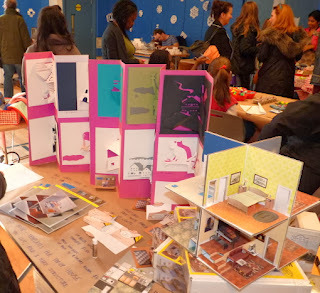 - You'll be able to drink & draw with Gowanus Open Studios/Arts Gowanus up there, too. 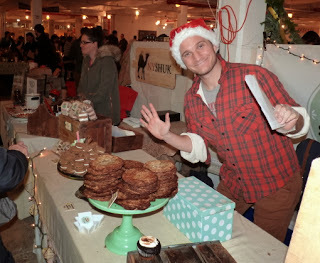 McBrooklyn swung by the Brooklyn Flea and Smorgasburg's giant new indoor location in Williamsburg (80 North 5th St. at Wythe Ave.) this weekend and actually had a good time holiday shopping. First off, the giant indoor space is only a couple of blocks from the East River Ferry so it's easy to get to if you live near a ferry stop. Second, though it was wet and cold outside, it was warm and comfortable inside. Third, many of the great vendors from last year (at the Holiday Market) have returned, but also some new, interesting crafts vendors as well. 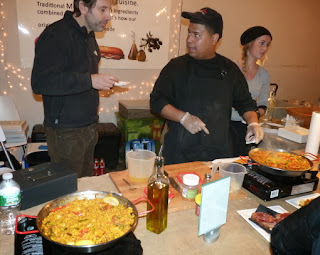 Food vendors included: HamOn, which sold Iberian ham sandwiches and paella (photo above); and Cutie Pies (cute little pies). BeeHive Oven served warm bite-site sandwiches on biscuits (yum! ); CheesePops stacked cheese plates on skewers. Jack's ChedBred sold killer corn bread with cheese and other flavorings; Red Hook Lobster Pound had lobster rolls, etc. etc. Most of the edibles were located in the food section, but a few vendors were apart from the herd (oysters, coffee). Smorgasburg says they will operate year-round at this location. 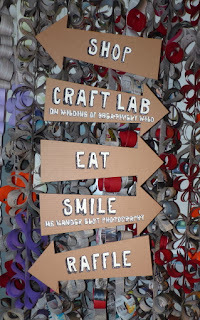 The Brooklyn Flea/Smorg combo runs every Saturday and Sunday through March 2014. Hours: 10am-7pm through Dec. 21/22, and 10am-6pm for the rest of the winter. From the scanner: A report of a man down an elevator shaft in a building on Dunham Place near Broadway in Brooklyn was called in at roughly 1:10 a.m. Monday morning. The building is a four-story elevator rental with six units near the Williamsburg Bridge. Real estate websites say "artists in residence." The NYPD has not yet confirmed; no further details. 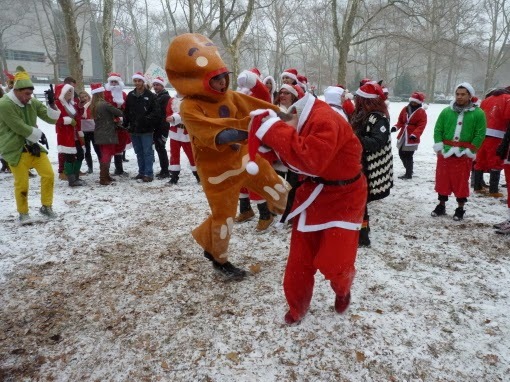 After hitting dozens of bars in the East Village, the drunken Santas, gingerbread cookies and reindeer of SantaCon 2013 streamed into Cadman Plaza Park in Downtown Brooklyn today, where a DJ blasting holiday music was set up in a tent. 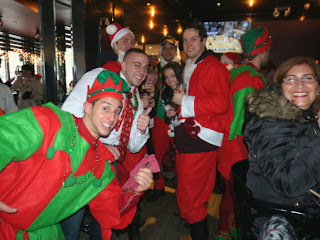 Other than some sloppiness, bad dancing and mock fighting, the crowds were fairly well behaved and played "reindeer games.". The 84th Precinct had a half a dozen officers stationed around the park, but didn't have to do much other than laugh at the participants. 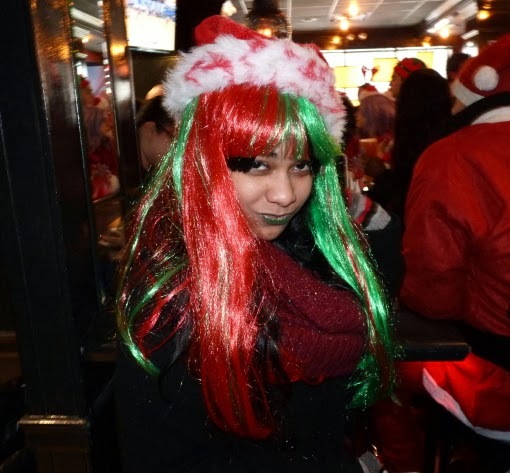 Hundreds of Santas quickly overwhelmed the Park Plaza diner, where those in charge didn't seem to understand the exact nature of the event and kept offering consumables other than beer. Others streamed towards Montague Street and DUMBO. This Santa was strikingly dedicated to holiday hair colors. 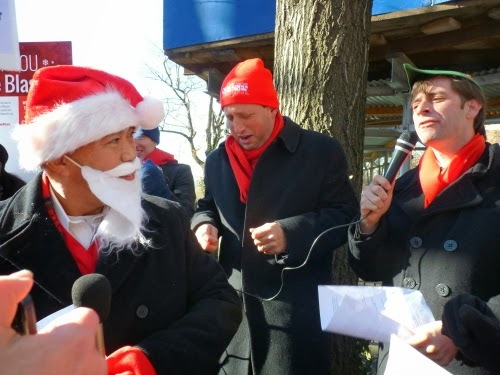 This year's event started at Tompkins Square Park in the East Village, and wound up with afterparties on Atlantic Ave. near Classon Ave.
Santa Claus and his elves -- City Councilmen Brad Lander and Stephen Levin -- joined the battle to keep LICH open today in a holiday skit put on for a crowd outside Long Island College Hospital in Cobble Hill. The skit was funny but the topic was serious. 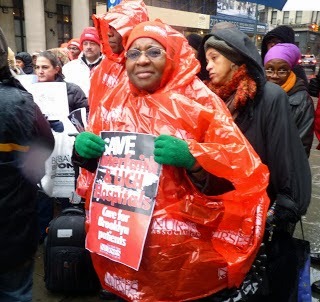 Participants said they were thankful that LICH is still open despite SUNY's numerous illegal attempts to shut it down. Santa drew up a list of the naughty and the nice -- Gov. Cuomo got a big lump of coal in his stocking, along with the whole SUNY gang and the DOH. The "nice" included Mayor-elect Bill de Blasio, state Supreme Court Justices Baynes and Demarest, Patients for LICH, NYSNA, 1199SEIU, community groups and their lawyers, patients, the local press and elected officials. NYSNA's Jill Furillo, supporters of Interfaith Hospital and others thanked Lander and Levin for their support, and also lauded Sen. Daniel Squadron and Assemblywoman Joan Millman. 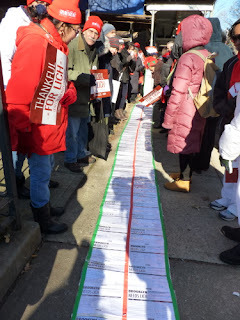 Supporters unfurled a petition signed by 15,000 local residents. 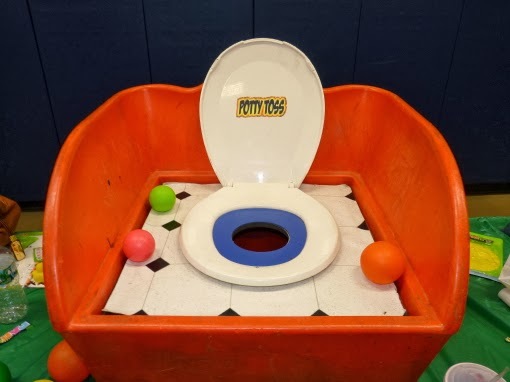 Monday's contempt hearing is on hold for another 30 days, according to the Brooklyn Eagle, and SUNY is expected to name a new operator in the next couple of days. It goes without saying that SUNY, again contrary to judges' orders, will chose an operator without consideration of the needs of the community and in total secret. Lawyers for the community say more lawsuits are on the way. Read a letter from attorney Jim WaldenGibson, of Dunn & Crutcher at the Eagle. Those fireworks going off over Ellis Island Thursday night around 9 p.m. come to NYC and Brooklyn (and New Jersey) courtesy of Nike, according to the Federal Register. The fireworks barge is located between Federal Anchorages 20-A and 20-B. Tonight, Community Board 6 voted down zoning application (BSA) for proposed private school in Red Hook. With this in mind, DUMBO’s official tree lighting (today, Thursday, December 12 from 6 – 7 p.m.) should draw Brooklynites like moths to a flame. 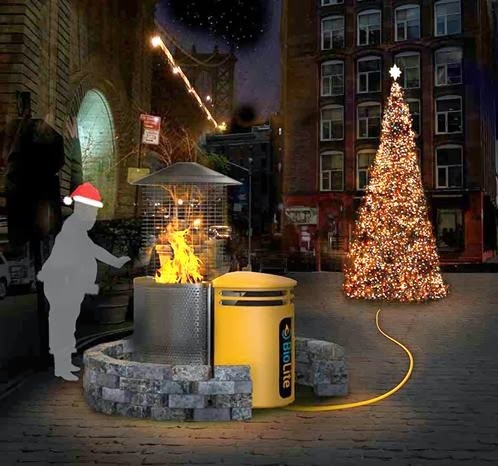 The tree will be illuminated using the electricity generated by a fire-powered high-tech stove designed by DUMBO startup BioLite. As added incentives, the event will also include Santa, live music, movie projections and more. McBrooklyn asked BioLite spokesperson Erica Rosen if marshmallows will be part of this scenario. 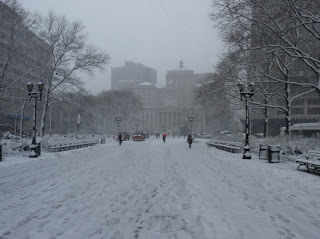 Her reply: "No Marshmallows, but we'll have Jacques Torres hot chocolate..."
The NYC Dept. of Health approved earlier today a new rule that all preschool and daycare kids in New York City must get a flu shot within 30 days. Most health experts agree that flu shots are a pretty good idea, but one group of parents say the DOH has no right to make the shots mandatory. 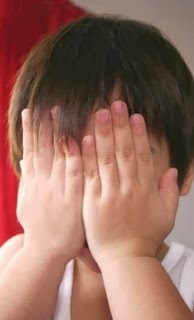 According to the Brooklyn Eagle, the Autism Action Network objects to the shots "based on what they say is the ineffectiveness of the flu vaccine, and the possibility of side effects, some of them serious." Unlike other vaccines, about half of the influenza vaccine produced in the U.S. contains mercury (a toxin that can cause brain damage) in the form of thimerosal, a disinfectant. A child receiving vaccine with thimerosal gets "17 times as much mercury as the maximum limit for a full-grown adult,” the Autism Action Network said. Doctors say that the risks of the vaccine are less than the risks of the shot. AAN's not buying that, however. Do You Know Where This Brooklyn Scene Is? The snow and the angle transform this familiar sight. Do you know where it is? Hint: It's somewhere in Brooklyn. Marty Markowitz lit his last Christmas Tree at Brooklyn Borough Hall last night. It was a bitter-sweet occasion. Luckily, he was accompanied by Santa, a giant gingerbread man and a large, flat white snowman at the Borough Hall kids party afterwards. Good times! According to the National Weather Service, Tuesday morning's snow should start getting real around 9 a.m.
NOAA calls for total daytime snow accumulation of 2 to 4 inches in Brooklyn. Some forecasters predict that the southern tip of Brooklyn -- areas like Coney Island -- could get up to 6 inches if the storm stays on track. NOAA: IMPACTS...SNOW WILL DEVELOP DURING THE MORNING COMMUTE...AND ACCUMULATING SNOW WILL CREATE ICY AND HAZARDOUS TRAVEL CONDITIONS THROUGHOUT THE DAY. 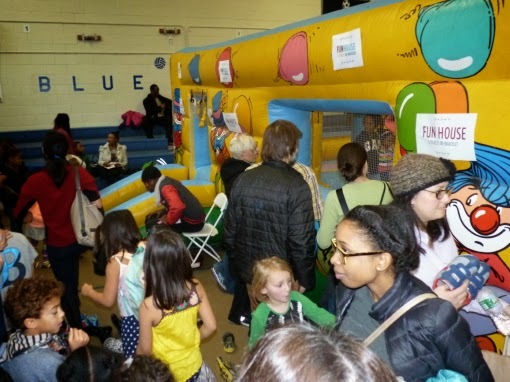 The huge Brooklyn Friends School Winter Festival took over the Pearl Street school building in Downtown Brooklyn on Saturday. 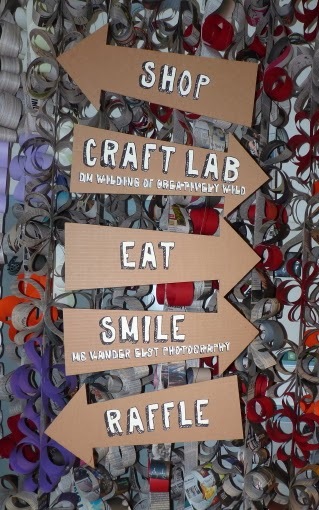 We always recommend this event because it provides a full day of fun, food and shopping for all ages. The Artisanal Crafts section downstairs was packed with tables filled with handmade jewelry, pottery, T-shirts, baked goods and all sorts of clever crafted items. We picked up a couple of nice holiday gifts here. There was a floor of carnival rides and games (that's one of several bouncy houses, above), another floor with a book sale, plus attractions like a middle school beauty salon and mini-skateboarding. Entertainment included a magic show and a reptile demonstration, among other performances. All the funds go for the Horizons Program at BFS, a good cause. Word came in around 11 p.m. that a missing 86-year-old man is driving around Brooklyn in a black Pathfinder with New York plates ending in 687. The man is a white male, 5'6" and 140 lbs., and is wearing blue jeans, a black vest and a dark hat. He was last seen on 74th Street. UPDATE: He was last seen driving on the Gowanus at Metropolitan Avenue. A Level 1 Mobilization has been called. If you see him call 9-1-1. 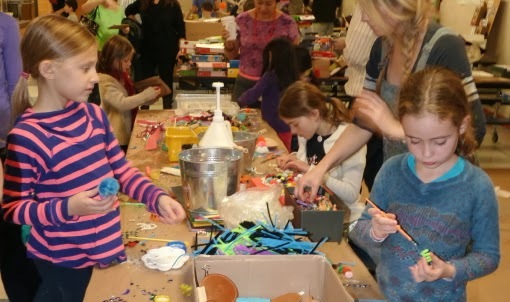 A great day of crafting, eating treats, smiling and recycling was held Saturday at the P.S. 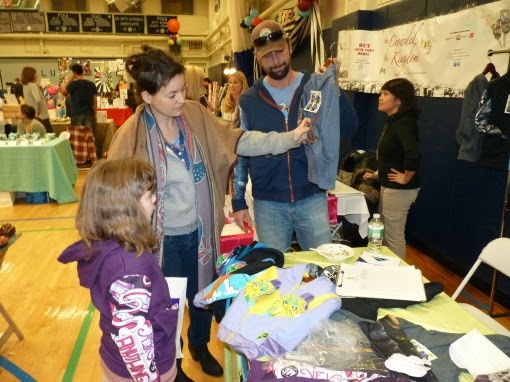 8 Holiday Crafts Fair in Brooklyn Heights. P.S. 8 parents and local companies manned the tables and students created their own objets d'art at the PS 8 Craft Lab. Come join friends and neighbors at the PS Bookshop in DUMBO for an evening of tastings.